Summary: Architecturally speaking the church of St. George of the monastery of St. John the New is important. 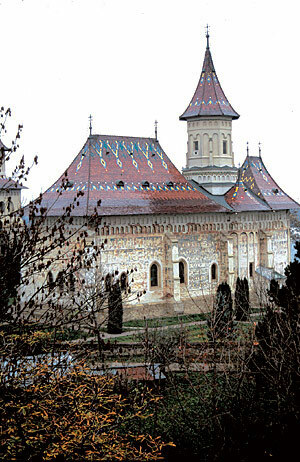 It is the only church of triconch plan erected in the period between the reigns of Stephen the Great and Petru Rareş. 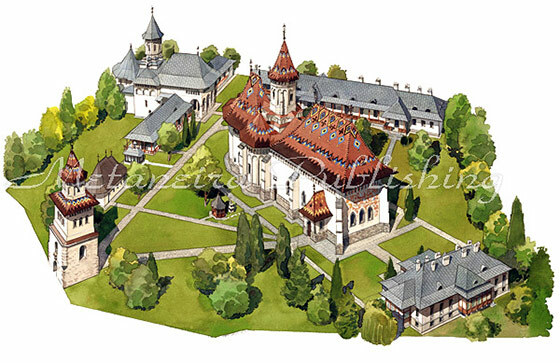 It is similar to the Church of the Ascension of Neamt Monastery, which from many points of view is a synthesis of 15th century Moldavian religious architecture. View of the Church of St. George from the northwest. 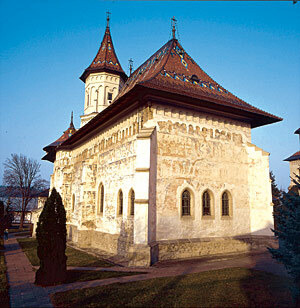 The previous church of the Metropolitanate must already by the end of the 15th century have been too small for its needs, and in 1514 Bogdan III started the construction of a new seat, the present church of St. George. The commemorative inscription above the door of the Church of St. George tells us: “With the Father’s will, the Son’s help and the Holy Spirit’s completion, the well-honouring and worshipper of Christ, Bogdan, by God’s mercy Prince of Moldavia, wanted to build this church of the Metropolitanate of Suceava that celebrates the great St. Martyr George, who helps win the wars. And he started building it in the year 7022 (1514) but never managed to complete it; but his son, Stephen, by God’s mercy Prince of Moldavia, with the help of God finished building up from the window level and completed it in the year 7030 (1522), on November, 6, during the 6th year of his reign; and it was consecrated by the hand of His Holiness the Metropolitan Bishop Teoctist“. Prince Stefăniţă finished the construction work as soon as he ascended the throne. He wanted to show that he continued his grandfather’s interest in building churches, but at the same time he strengthened his authority that had significantly diminished during his minority. The church windows, of which there are fifteen, are of Gothic style. They all have pointed arches and receding carved stone frames, except the apse windows, which are with round arches. Even the exonarthex windows are not very big, and the difference between these and the impressively tall windows of Probota and St. Demetrius is marked. 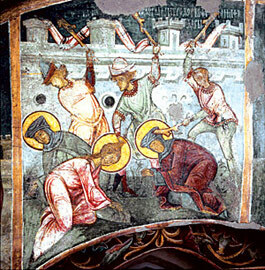 The façades were painted during the reign of Petru Rareş, in 1534, at the same time the Prince was building the Church of St. Demetrius nearby. On the exterior, two rows of small niches go around the whole church under the eaves, except on the west façade, where there is only one row. On the south façade, some of the niches still retain vividly painted figures of Archangels. The western end of the façade, the space between the first two buttresses, is covered with The Akathistos Hymn dedicated to the Virgin Mary.The west façade is painted with The Last Judgment. Only the churches of Pătrăuţi and Voroneţ have the representation of the Judgment on their west façades, both painted about 15 years later than St. George. Only here and in Voronet the entrance to the church does not go through this scene. 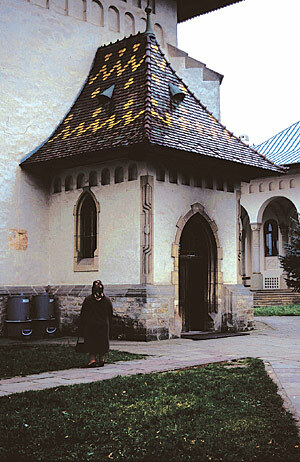 The entrance to the church goes through a small open porch on the north façade. The exonarthex is vaulted with a small dome in the middle of the room, supported by the oblique arches of the Moldavian vaulting system. The structure of the room is identical to the structure of the exonarthex of the church of Neamt Monastery. 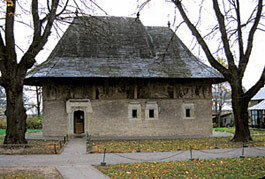 Earlier, it was assumed that the exonarthex was a later addition, as on the south wall of the compound there is an inscription of 1579, which says that the space was added to honour the relics of St. John the New. 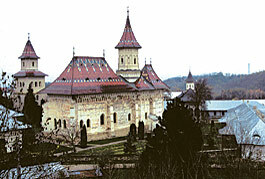 The inscription was imbedded to the wall during the restoration works of 1896, but as in 1579 the relics were in the Church of Mirăuţi, the addition of an exonarthex must refer to that church. The mural paintings of the whole interior were made most probably in 1534, as on the remaining part of the votive painting, in the naos, there is a fragment of an inscription: “In the year 7062 (1534), the month of…”. Some researchers are of the opinion that the church was painted immediately after the church was built, in 1522. The mural paintings are of high artistic quality, but covered with black layers of soot, dust and salt efflorescence. 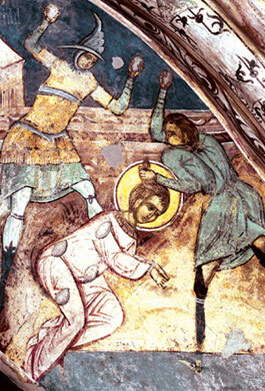 The church is under restoration, which has brought to light scenes of great beauty. 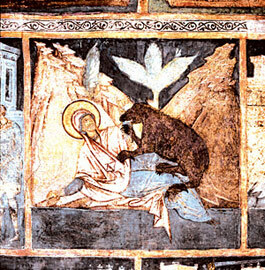 The walls of exonarthex are painted with the first six months of the Orthodox liturgical calendar, The Menology. St. John the New Monastery – general view. 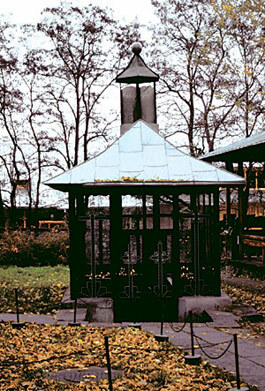 The Metropolitan Bishop Anastasie Crimca erected the small chapel in the late 1620s. Commemorative candles for the dead and the living are lit inside a small construction of glass. A scene from the pronaos. Faded frescoes are preserved on the south and west façades of the church. The interior is under restoration, and very beautiful scenes have been uncovered in the pronaos.